Welcome Teachers! 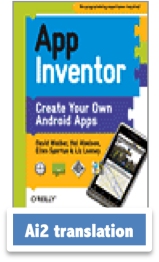 Getting ready to teach with App Inventor is easy with the following resources. Concept cards offer concise summaries of some of the basic concepts of making apps. Great for use in the classroom or on your own. Maker Cards help new users get started quickly with mini-apps that can be made during the course of a short workshop or class. Teaching app creation is a 6-week online course intended for teachers instructing teams of students involved in the Verizon Innovative App Challenge or anyone interested in teaching with App Inventor. The course combines software design processes, programming with App Inventor, and pedagogical approaches to give teachers a complete introduction to both computer science principles and App Inventor itself. Running a workshop or teaching a first class? These short, introductory apps get your students to that "a-ha" moment quickly and easily, leaving them ready to dig deeper into the powerful capabilities of App Inventor. These are the videos that the App Inventor team uses for introductory workshops. Students can build three apps: TalkToMe, BallBounce, and DigitalDoodle by watching the vidoes or by following the step-by-step pictures and text on the PDF versions of the tutorials, which are linked at the bottom of the page. Happy Inventing! Offering a Course-in-a-Box, the App Inventor Book (free online! ), video tutorials, a concept map, and more, AppInventor.org is a site you'll want to bookmark. Led by David Wolber at University of San Francisco, this team offers resources to help you run any course whether it's for a day or a semester. Mobile Computer Science Principles (Mobile CSP) is based on the College Board's emerging Advanced Placement (AP) course in computer science. Students learn computer science by building socially useful mobile apps. This course was developed by Ralph Morelli and his team at Trinity College. Here you'll find links to materials developed by the Mobile Computational Thinking Project, as well as other great curricula and resources developed by educators from around the world. We need you to contribute to App Inventor's Resources!